Got most of my firewood split over the past fortnight & was feeling a bit lazy this morning, so went through my pics from this year's foraging and picked out some to share together with some stories that go with them. 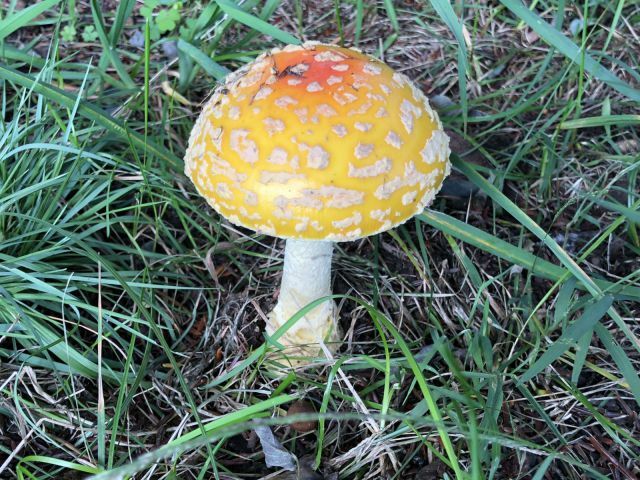 I was walking through the woods at our new place -- let's call it Bear Swamp -- and a bit of bright yellow on an old stump caught my eye. Looking closer, I saw the prettiest patch of yellow fairy cups, with some purple jelly drops nestled in the moss. My favorite pic in quite awhile. 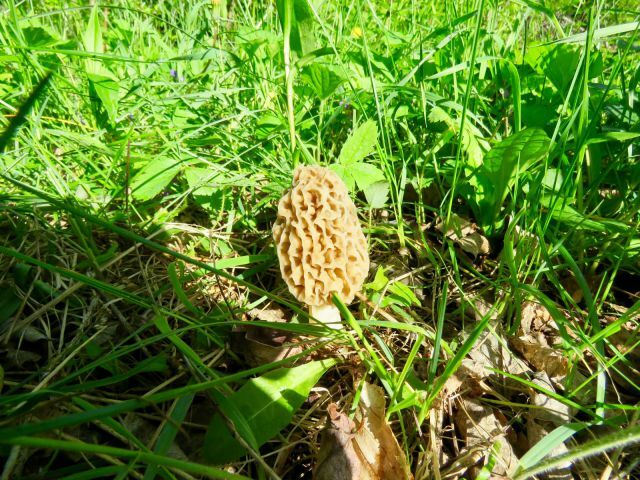 This was our first spring at Bear Swamp, and we were fortunate to find yellow morels growing under an old ash tree. Thus began our feasting this year -- cuz Bear Swamp provides! 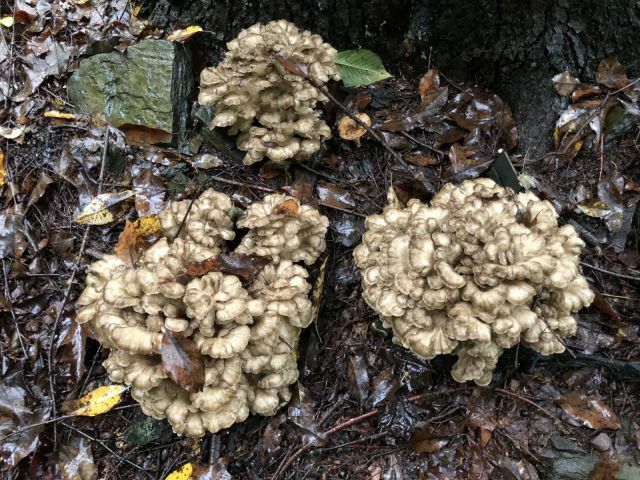 After the morels were past, we were blessed with bountiful harvests of chicken of the woods, which we found growing in four separate locations at Bear Swamp this spring & early summer. 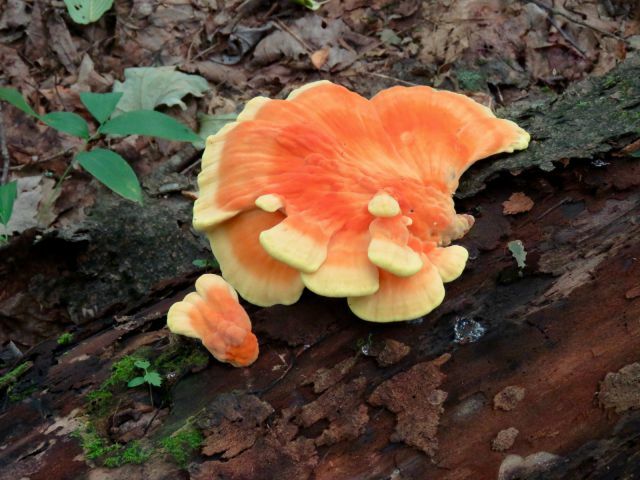 For those of you that haven't had the good fortune to try chicken of the woods (Laetiporus sulphureus), it has the taste and texture of chicken & can be substituted for chicken in a recipe. We did ours primarily on the grill with various marinades. I was serving cold leftovers to folks & they loved it. I have bunch dried in mason jars for the winter. 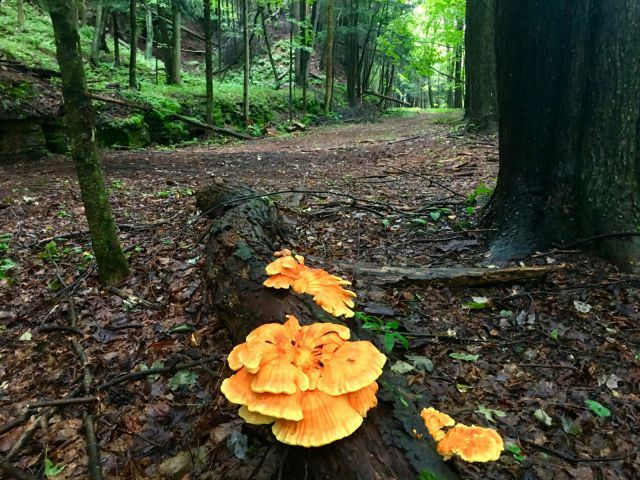 Chicken of the woods has been found to inhibit bacterial growth. We let a number of fruits stay in place, and they slowly decomposed over the course of the summer, but with no discernible bacterial or fungal growth on them. Good medicine. 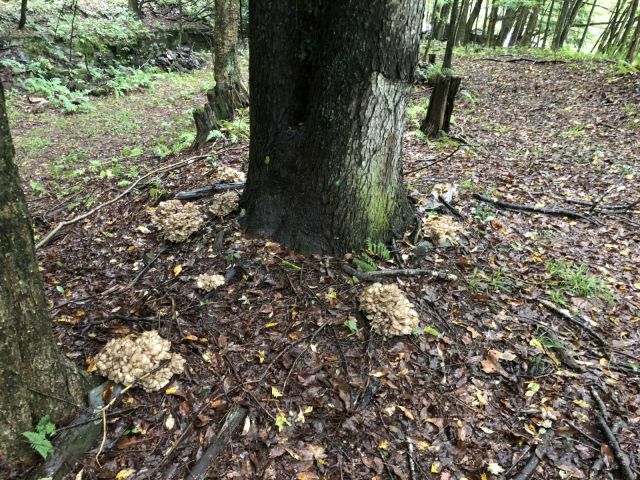 We were also tickled to find maitake (Grifola frondosa) growing under a pair of old black cherry trees. 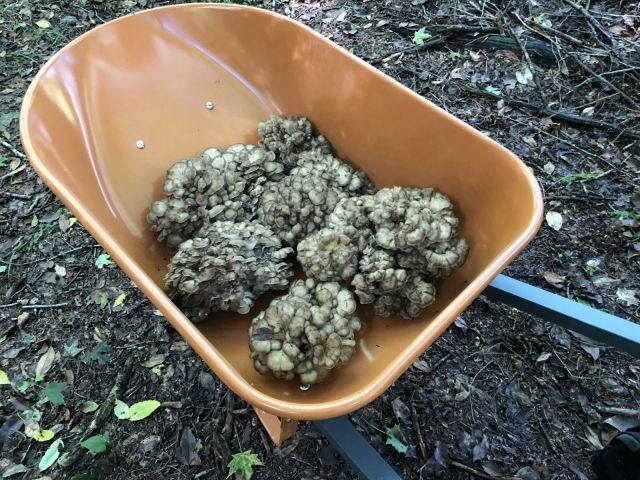 We harvested about half the maitake we found -- a total of 16 pounds when cleaned & processed. Made tons of soup & have about 10 lbs (wet weight) dried in mason jars that we're tossing in various recipes. 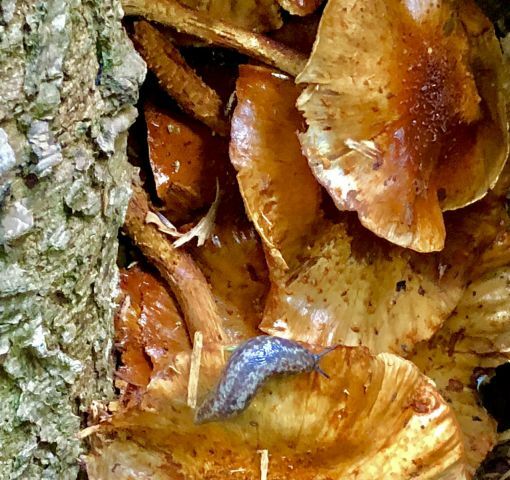 The biggest edible surprise this year was a huge patch of mushrooms -- over 50 fruits with more sprouting -- growing under an evergreen. 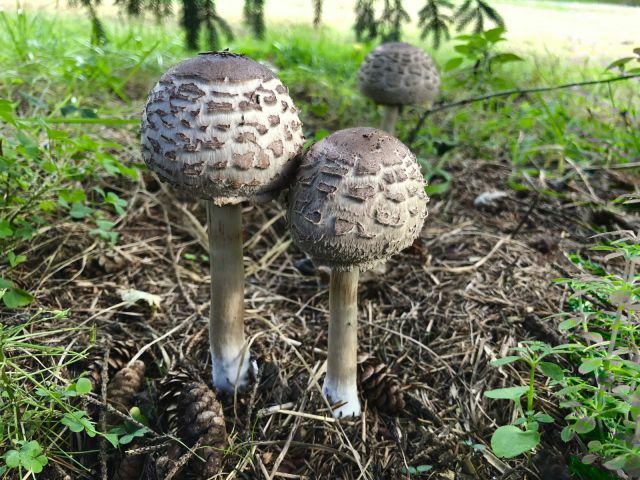 (Chlorophyllum rhacodes), which were listed as "choice, with caution". 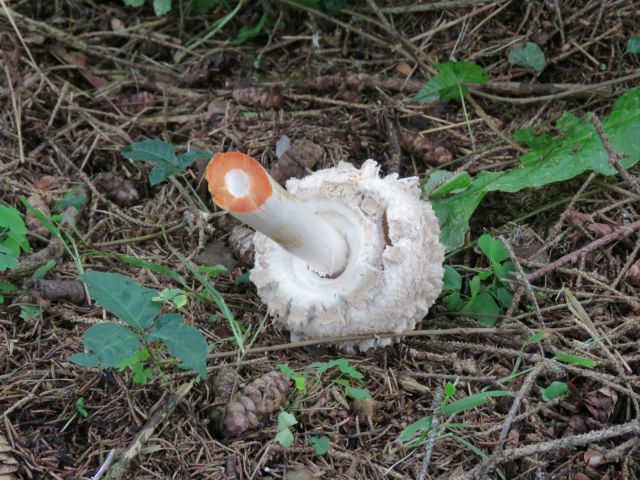 Fortunately, there was a quick test to distinguish it from C. molybdites, a toxic relative for which it is often mistaken, apart from the green spore print characteristic of the molybdites -- the rhacodes, when freshly cut, changes color from white to saffron yellow to orange & finally to maroon. In addition to being plentiful, the rhacodes were also delicious -- I'd compared them favorably for taste & texture to a morel. 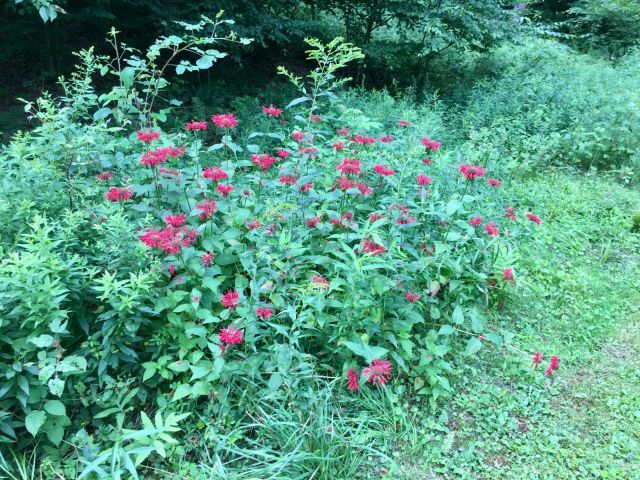 I'm really impressed with this species as a choice edible, and distributed a number of the fruits to other locations on Bear Swamp in the hope that I can get them flourishing. I've also made a couple extra spore prints if anyone is interested. I'll be starting some MS cultures in the future when spring rolls around again. 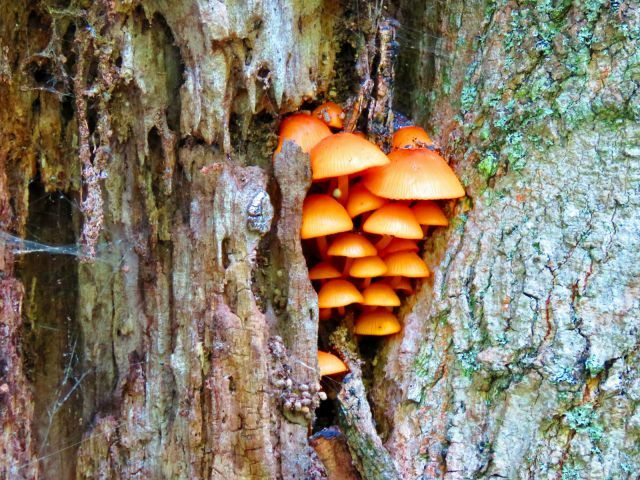 They grow on leaf debris & seem to me to be symbiotic with healthy trees. 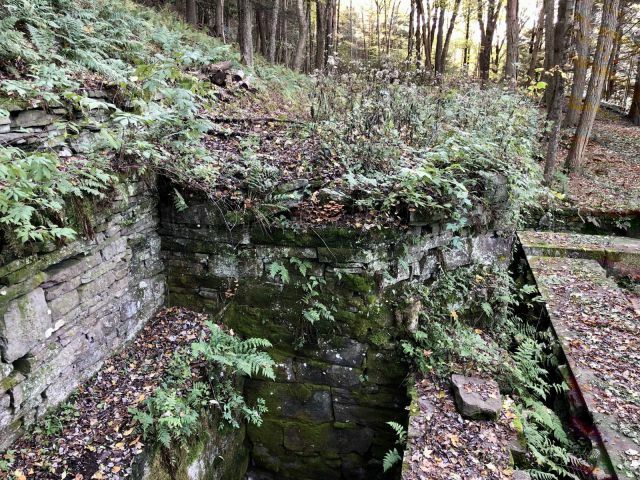 The woods at Bear Swamp have a secret -- a foundation structure from abandoned railroad that we call the ruins. 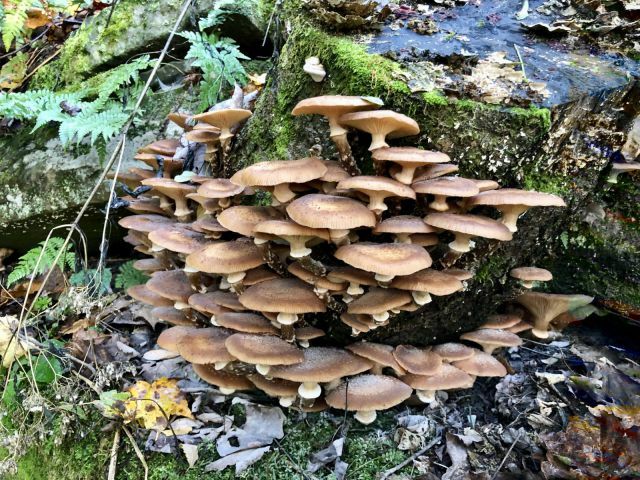 This year the ruins produced honey mushrooms with identified anti-tumor properties. 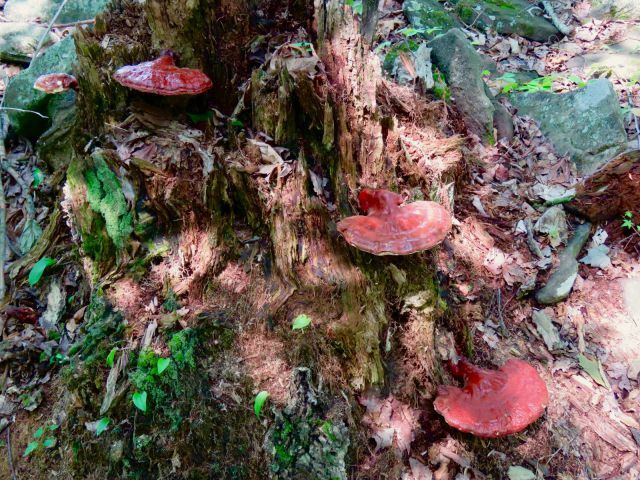 Here's a closeup of the honey mushrooms at the ruins. 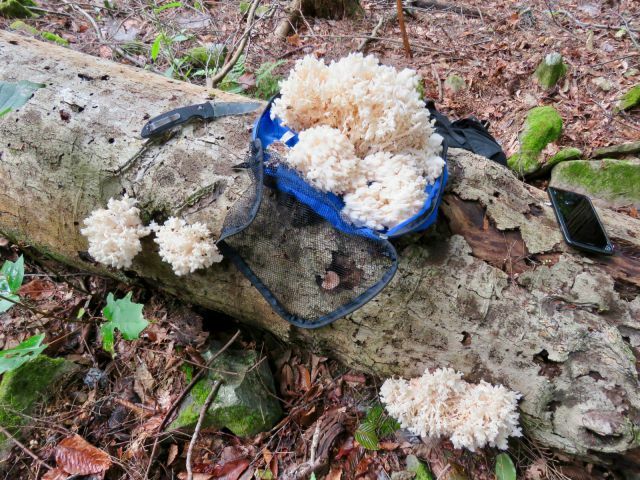 Crowned coral fungus -- edible & has a peppery taste. 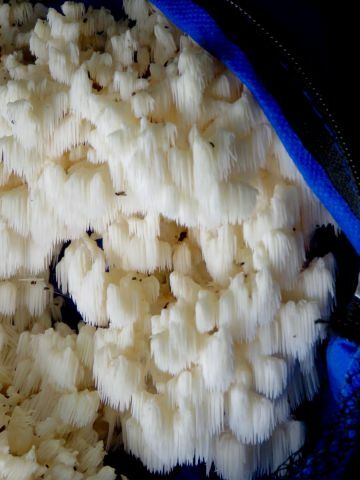 Local hericium -- tastes like lobster when sautéed -- start with olive oil & add butter when almost done. Best when young. 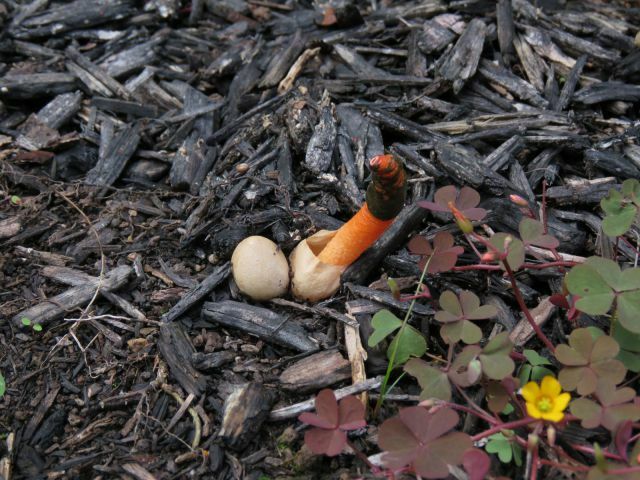 Elegant stinkhorn emerging from "egg"
Scarlet Bee Balm a/k/a Oswego Tea. Contains bergamot oil & was used for tea by both the early colonists & old bears everywhere. 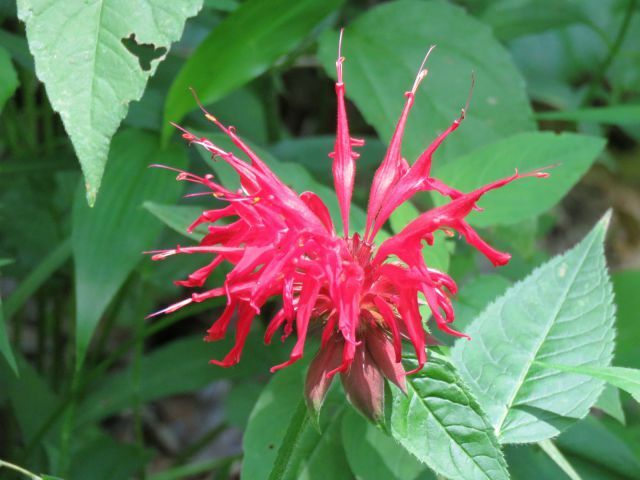 Leaves can be crushed into a poultice & applied to insect stings, hence the name "bee balm". Each flower head is actually a sphere of individual flowers. In addition to the one pictured here, there were 7 other large fruits that I was going to let grow & sporulate before harvesting. But when I went to check on them the next day, they were all gone! I could see teeth marks at the base where the stipes used to be -- deer had eaten them all overnight. A little research confirmed that our four legged friends do in fact like to catch a buzz on these babies. Santa & his flying reindeer, eh? I was more careful & placed pails over the fruits from the next flush, which have been dried for further experimentation. Edited by OldBear, 01 November 2018 - 01:06 PM. Wow! What a fabulous plethora of mushroom species! Thank you for sharing. That is the ultimate treasure hunt for me. Are we sure that they "yellow coral" is a coral species? 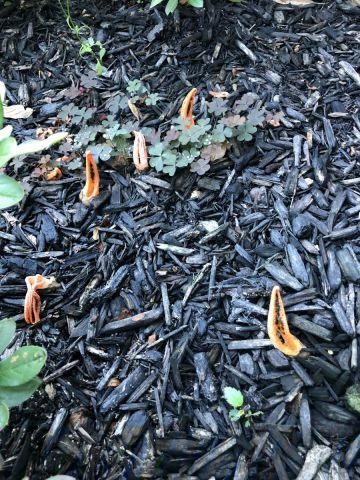 Typically coral doesn't grow up from the leave litter like that. There could be wood under the leaf litter... I am confident that you would not have made the assertion unless you were sure but I wanted to inquire for discussions sake. Edited by PJammer24, 01 November 2018 - 01:17 PM. Not at all sure of the coral & probably should have said “coral-like”. Have run into it a couple times & will pay more attention the next time to see if we can get the species nailed down. I just liked the picture. 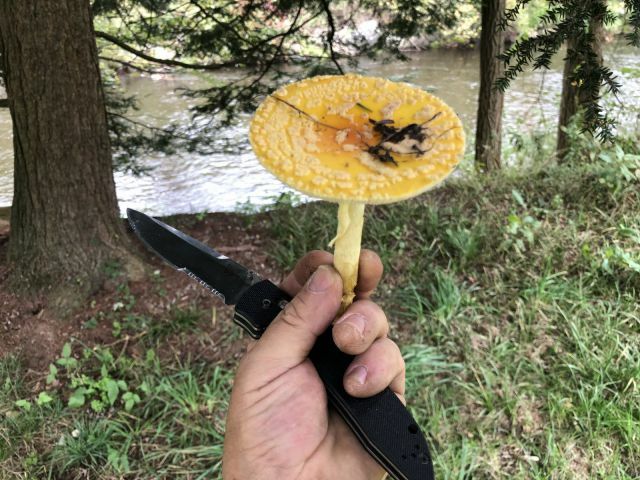 Shrimp of the woods you say? Your post was the first time I’ve heard the term & did some research online. 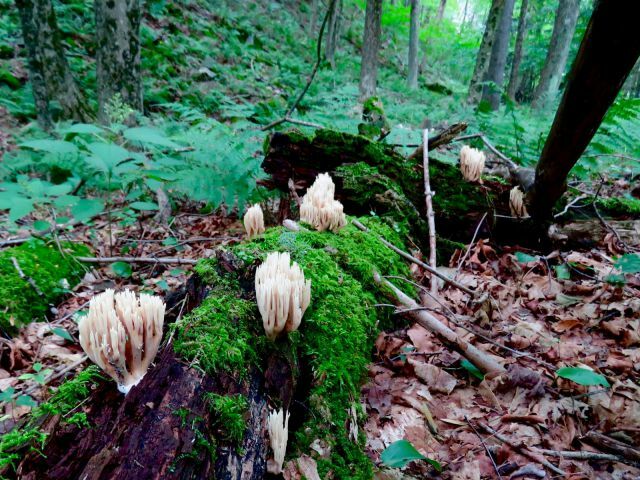 Pretty sure I have seen them in my wanders & was wondering what they were. We’ve had a balmy past couple days & everything is still soaked from the constant rains. Will keep an eye open & see what I can find. Edited by PJammer24, 01 November 2018 - 02:35 PM. 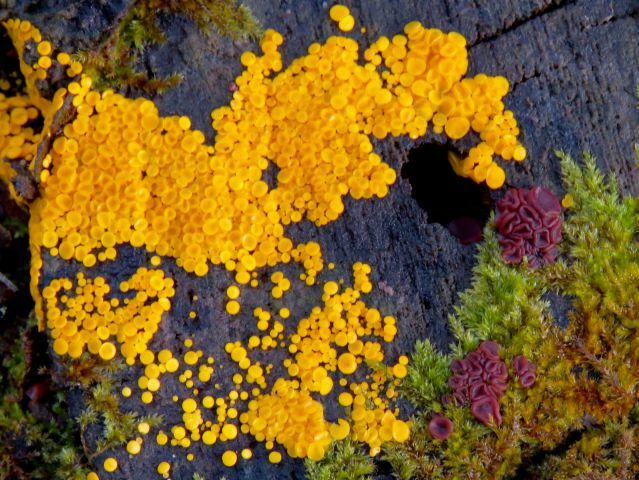 The yellow coral like one may be spathularia flavida, yellow earth tongue. 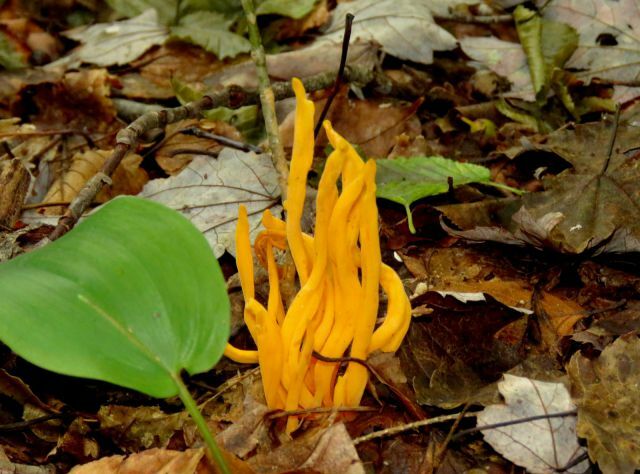 I thought the same thing, but was also wondering if it could be a yellow tuning fork variety, either Calocera viscosa or C. cornea. Will pay closer attention next time. There’s been a lot to discover. We’ve had the wettest year on record for our neck of the woods and still have green leaves on some trees on Nov 2. Used to be leaves would all be down by Halloween. 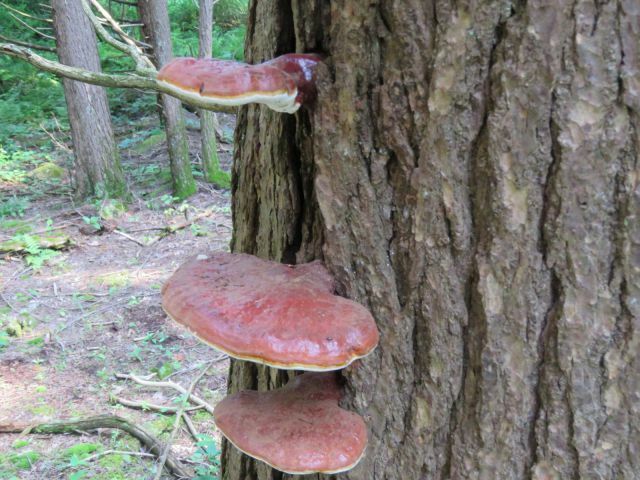 I omitted our favorite foraging target: turkey tails! 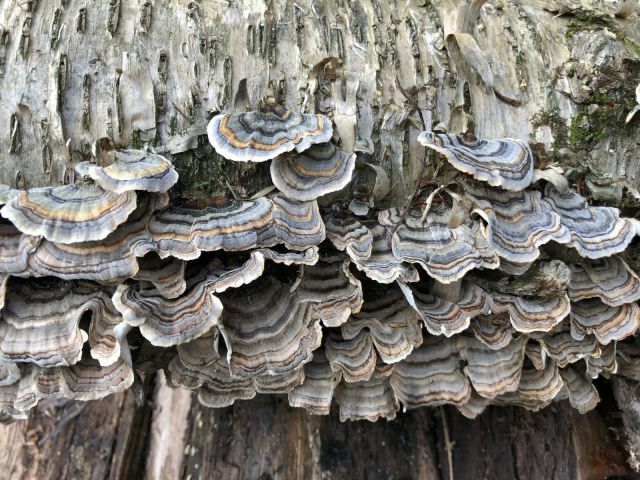 A cup of turkey tail tea before bed is a fine evening ritual. Edited by OldBear, 02 November 2018 - 09:33 AM. It's an undescribed species of Clavulinopsis which is currently going under the misapplied name Clavulinopsis fusiformis in North America.